Just like the NBA Finals, the Stanley Cup Final has featured a ton of celebrities thus far and Game 3 was no different. 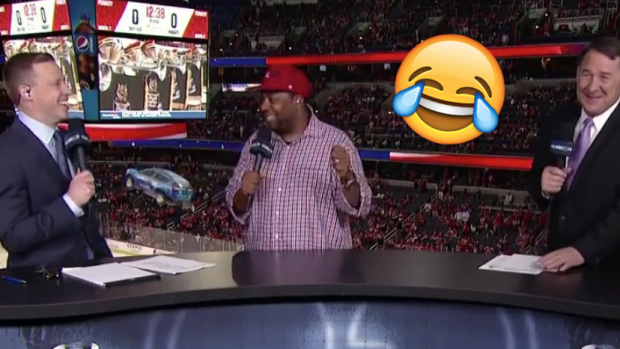 'Knuckle-puck guy,' better known as Kenan Thompson of 'Saturday Night Live' was one of the celebrities in attendance and during the 1st intermission, he did he best Charles Barkley and Steve Harvey impersonation with a hockey twist. Jets fans, don't get mad with Thompson. Steve Harvey has made mistakes in the past in situations like these. It happens. The impersonations were spot on and by the looks of it, Thompson's enjoying himself so far. He wasn't the only celebrity to take in Game 3 of the Stanley Cup Final, either, as the original 'Wonder Woman' was in attendance cheering on the Caps.